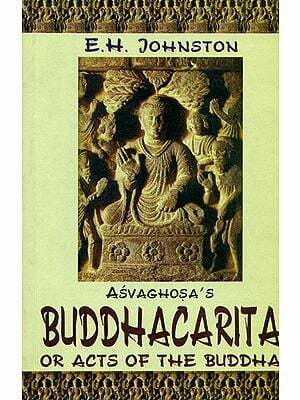 The Way of Buddha-an illustrated catalogue of the exhibits, rare and unique in many respects that had accompanied an international exhibition organized by the India Museum in the fine Arts Museum of Mongolia, Ulaan Bataar, Mongolia in September 1993 has long been exhausted since its first publication. The exhibition organized under a Memorandum of Understanding between the Government of India and the Governments of Mongolia and Singapore to promote the art & culture among these countries had won wide appreciation and thousands of people had visited it and enjoyed it and rediscovered the age old historical connections that existed among them from time immemorial. The reprinted copy of the said catalogue will, we hope, satisfy the academic need of the general public as well as scholars who have long searched for it. Indian Museum, Calcutta, the oldest institution of its kind in India, was founded in 1984. It is the largest multidisciplinary museum of the country carrying various activities and researches on Art, Archaeology, Anthropology, Geology, Zoology and Economic Botany. The collection are rare, both Indian and trans-Indian relating to these, disciplines and are now preserved and displayed in the galleries of the Museum.’ The Art and Archaeological collections are unique in many respects belonging to the earliest time through the ages. Buddhism played an important role in the pursuit of art activities in India. The collections of the Indian Museum, being the richest in art and archaeological materials, have also varied specimens of the Buddhist art through which the life and the message of the great master are depicted. His previous births in the form of Jataka stories have amply been illustrated on the railings of Bharhut now preserved in the Indian Museum. His life is well represented in the art of the Gandhara region. This art reached its apex at Mathura and Samath during the classical age of India under the Gupta rulers. 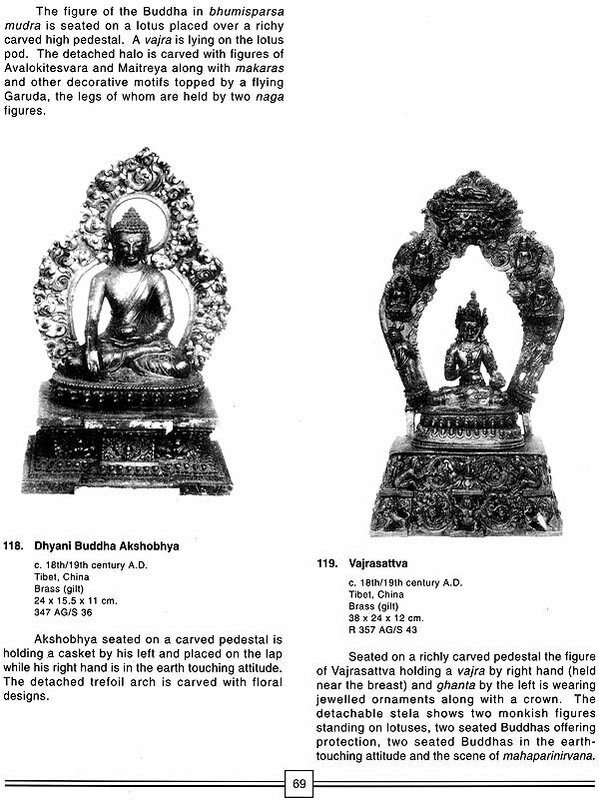 Along with Budhism, the Buddhist art of India is manifested in its various aspects throughout India and beyond. Amaravati, Nagarjuna konda, Nalanda, and many other places were great centers of Buddhist studies greatest contributions of India to the world, especially to the Asian and the South East Asian countries where Buddhism is a practicing religion. This exhibition” The Way of the Buddha”, is an epoch-making event for it is the first time that an exhibition on’ Buddhist art has been organized by the Indian Museum in Mongolia as fulfillment of an Indo-Mongolian Cultural Exchange Programme. This has been possible because of the keen interest taken by the Hon’ble Minister, Mr. N. Enkhbayar, Department of Culture, and Government of Mongofia, who visited Indian Museum in May, 1992 He desired to have an exhibition like this to be sent to Mongolia to bring forth the India. Mongolian relationship which goes back to as early as the fifth century A.D. The exhibition has been meticulously conceived and organized so that life and the message of the lords well represented through the exhibits. The exhibits are rare and unique in many respects. All total, there are 130 objects out of which 116 are in originals, 14 are replicas in fiberglass and some illustrations in photographs. It has been proposed that the replicas and the photographs which form a part of the exhibition shall be, the nucleus of a permanent exhibition of Indian art at Ulaanbaatar, Mongolia. The exhibition has been divided into five major parts, each depicting a particular theme connected tint the ‘Buddha-the life, the message, the pantheon, spread of ‘Buddhism in India and abroad. The, exhibition however, is not merely a display of art collections but reflects through these exhibits the message of the Great Master of universal compassion and Brotherhood. The Indian Museum, Calcutta is, therefore, privileged to present this exhibition to the people of Mongolia to promote the mutual understanding, cooperation and friendship of these two great ancient nations. Buddhist art reflects mot faithfully all the important stages of the Buddhist religion. At the earliest stage, Gautama Sakyamuni was regarded as an ideal human being who could recommend salvation by the individual’s work and action by following the eightfold path. Such a religious solution offering salvation through moral discipline required no anthropomorphic representation of the Master. Thus, in the Buddhist art of pre-Christian centuries the Buddha appeared as symbols, such as, empty throne, the Bodhi-tree, pair of footprints, Dharma chakra etc., During this time mythology Buddhism also came to include a collection of moral tales, relating the events in the earlier incarnations ( both in animal or human form) to acquire the stage for attainment of Buddha-hood. Following the master’s death Buddhism acquired greater popularity which drew adherents from all sections of the society; consequently monastic Buddhism developed. An important change is noticed during this time with the introduction of monastic Buddhism. There was no broad distinction between the clergy and the laity. 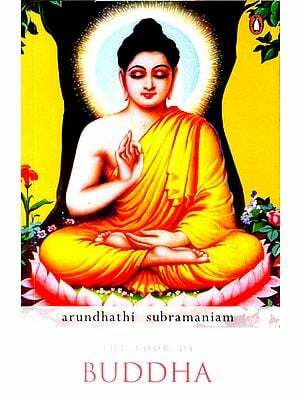 Attainment of Buddha hood through salvation was possible at this tag by those who had abandoned the world. Such an outlook brought about a remarkable change in Buddhist theology and doctrine. This was the period when a slow but steady intrusion of the idea of Puja or worship was introduced. The Buddha at this stage was not merely an ideal human, but a good. The worship of the bodily relics of the Buddha or symbols was the answer to this. In slow but steady process the religion went for iconic manifestation of God. This revised form of Buddhism was of immense importance for both the religion and the art. The Worship of personal god conceived in anthropomorphic form became inevitable. 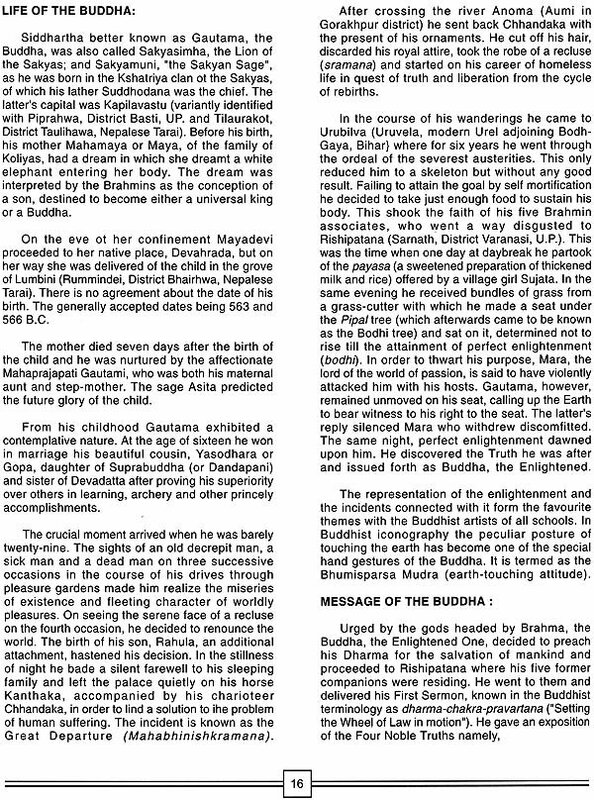 The changed religion was called Mahayana, as distinguished from the earlier one which was known as Hinayana. In the iconography of Mahayana Buddhism, the concept of trikaya, i.e., three bodies of Buddha-the dharmakaya (Law body), the sambhogakaya (Body of bliss) and nirmanakaya (body of mortal shape) played a vital role. This concept was further advanced in the development of five mythical Buddhas of four directions, and one of the centre. The final and esoteric stage of Mahayana Buddhism is known as Vajrayana, the central concept of which is Adi Buddha-a self created primordial being. The five dhyani Budhhas emanated from this. Historically speaking during the time of the Mauryan Emperor Asoka the Buddhist art had its beginning. Tradition asserts that immediately after the demise of Gautama Buddha eight stupas were built over his mortal remains. Asoka is credited with the erection of eighty-four thousand stupas over the Buddha’s relics which he is said to have collected from the stupas of the earlier period. Though this number is hyperbolica, there is, however, no doubt that as a zealous Buddhist. Asoka erected a large number of stupas in different parts of the subcontinent to popularize the religion of the Buddha. It is held that the original brick stupa at sanchi was constructed by him. He also erected a large number of monolithic pillars with inscriptions for propagating Buddhism. These pillars showing an unified style consisted of long monolithic shafts, tapering at the top, crowned with animals seated on abacus. The pillars, some are still in situ are as ‘bright as jade……..glistering like light’ because of smooth polish and high craftsmanship. The animals surmounting the capitals are bull, lion, elephant. It is generally believed that Maurya stone productions, which are stimulated by foreign models, were largely the result of the royal patronage. The Sunga period (C. 2nd century B.C.) was one of the most creative periods of Buddhist art. Though the Sunga rulers were followers of the Brahmanical faith there was no set –back in the propagation of popularity of the Buddhist faith. As a matter of fact the patronage during this time came from all sections of the people, belonging to different types of professions other than royalty. The Buddhist establishments flourishing at Bodh Gaya, Bharhut, Sanchi, Amaravati, Nagarjunikonda, Bhaja, Nasik Karle, Ajanta, etc., testify to this . The art of this period has been conceived in two forms:one, on the rock-cut temples of viharas (some of which are embellished with painting) and the other on the railings and toranas (gateways ) to the Buddhist stupas at different places. General Cunningham discovered the ruins of the railings and gateways of the stupa at Bharhut (Madhya Pradesh) during the year 1872-74 and part of this heritage was brought into the Indian Museum, Calcutta in the year following. In the absence of the existence of the Stupa itself. It is difficult to ascertain its shape and size. But it was probably similar to the type of stupa represented on panels engraved on its railings; it seems that it was almost contemporary to the stupa at Sanchi. All these Stupas consist of a hemispherical dome with a harmika above supporting the umbrellas. The appearance of the richly sculpted pillars, crossbars and coping stones, containing human forms, showing popularity of the thems like Gajalakshmi, Yakshini, Yaksha, Kalpataru, etc. A common motil on the Bharhut vedika is the lotus medallion, at times with representations of fasces of humans for humanlike figures. The worship of the Bodhi-tree, seems to have been widely prevalent, as these are many representations of its on the sculptured panels of Bharhut, Sanchi and Amaravati. The main interest of the art of sanchi centres round the Great Stupa. Originally built of brick, during the reign of asoka, it was encased in stone and brought to its present dimension about a century later. The other additions, such as the erection of the toranas and the ground balustrade were done still later, probably about 50 B.C . of all the gateways, the south gateway seems to be the oldest as evidenced by an inscription showing was the gift of Ananda, a foreman of the artisans of king Sri Satakarni (1st century B.C.). A stylistic equivalent of the panels of Sanchi Stupa has been found in the carving from a Jaggayapeta stupa near Amaravati on the Krishna river. The evidence is interesting as it shows how the stupa architecture followed a common pattern all over India during that period. During the first three centuries o Christian era several important schools of sculpture flourished in different parts of India. Two prolific schools evolved during this time under the Kushaas, between A. D. 50 and 200. One is Gandhara, stretching upto Bactria in northern Afghanistan and Mathura in northern India. At about the same time a school of sculpture emerged in the eastern Decan,i.e. the Krishna Godavari region under the Satavahanas, Interestingly the art work of this time which was primarily Buddhist thrived on internal and international trade. Of these three centres the artists of Gandhara combined Hellenistic, Roman and Parthian artistic norms with Indian iconography, creating a hybrid art form in harder schist and stucco. Five hundred miles south of Gandhara, Mathura situated almost in the heatland of India developed completely different style of art under the patronage of the Kushanas. The sculptured decorations of the religious establishments of Mathura, Brahmanical, Budhhist and Jain, from pre-Kushana time through the Gupta period, were all carved from the red sandstone quarried at Sikri. The third important stone sculpture distinguished by its greenish white limestone, emerging at Amaravati, Nagarjunikonda and various neighbouring sites in the locality was entirely Buddhist in content. Interestingly, all the three schools show their awareness of contemporary Hellenistic Roman art tradition. While Gandhara could be regarded as the easternmost expression of the classical art of Greece and Rome percolated through Asian provinces, mathura and Amaravati show a clever absorption of the technical artefece of Bactro-Roman sculptural forms by local sculptors. The period is remarkable as it gave for the first time the figural representation or the anthropomorphic form of the Buddha. The Gandhara school is created with the first representation of such images. The portrayal of Sakyamuni as a man seems to have been linked with the emergence of devotional sects of Buddhism. From the first century A.D. onwards the artists of this region began to produce large number of Buddha and Bodhisattva images along with other Buddhist deities. Stylistically the art of Mathura, though in many respects an outgrowth of the archaic indigenous base, it undoubtedly shows influences of the contemporary foreign artistic traditions like that of Gandhara. With regard to the origin of Buddha images the sculptures of Mathura also deserve credit for creating the image of the Buddha-but entirely from the indigenous base. It is important to note that making of an image of the Buddha involved much more than the mere carving of a human effigy. One observes that in making of such images, the artists wanted to portray a final achievement of the yoga state serenity and complete mental equilibrium, to exhibit superhuman perfection that the concept of the Buddha stood tor. In Mathura such concept is shown in the expression of face characterized by radiant expressions, open eyes, round shape and lips lightened with smile. During the Gupta period the Buddhist art of Mathura achieved a synthesis of Mathura elements of the earlier period. The high point of development in South Indian Buddhist art was attained in the Krishna-Godavari region during the time of the satavahanas and the lkshvakush .The most famous sites of this region are Amaravati and Nagarjunikonda. Large collections of these beautiful carvings are preserved in the Govt. Museum at Madras and the British Museum, London. The subjects comprise of the Jataka stories, scenes from the lite of the Buddha, the contemporary scenes and events, besides a large number of Buddha images. Stylistically the art of the Krishna-Godavari Valley is characterized by foreign art traits in arrangement of composition, stances, in figure-arrangements and in setting the composition in a number of planes. The Gupta art followed fundamentally the styles that they had inherited, but one observes how cleverly the artists replaced the dynamic vitality and heroic energy of the earlier schools by this period iconographic and aesthetic manuals appear to have been systematized; the normorthe denominator set up by the Gupta artists was widely diffused, not only in different parts of India, but to other Asian countries. The primary concern of the artists was with the human form, but this was endowed with a largeness of conception of mental and physical discipline. The finely carved Buddha figures with eyes half shut, suggesting inner concentration and compassion are the best manifestation of this stylistic trait. 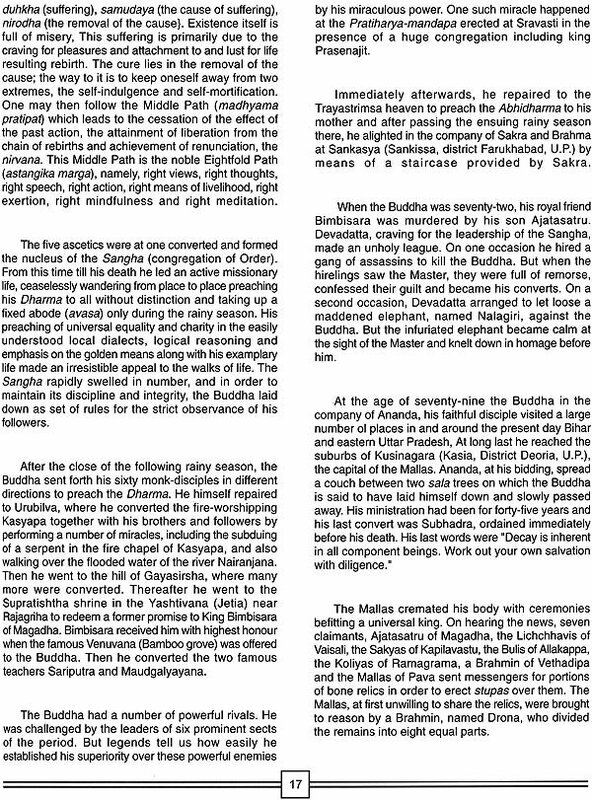 The main centres of Buddhist art during this phase ere Mathura, Sarnath and Ajanta. The Buddhist images of Mathura and Sarnath during the Gupta period are some of the best specimens of Indian art. The graceful slender body frame, the relaxed pose and the great delicacy of the treatment of the folds of the transparent garment adorning the Gupta figures, is never equaled by any art specimen. The profusely decorated halo is another special feature characterized by the downcast eyes, a feeling of quiescence and introspection, expression of response and blissfulness epitomize the Buddha logical message. The bronze Buddha image from Sultanganj and also one from Dhanesar Khera together with a number of specimens found in north-western part of India are some excellent specimens testifying to the skill and ability of the Gupta metal carvers. The artists during the Gupta period showed equal skill in the carvings of Brahmanical images as well. This period is also known for excavation of several rock-cut viharas and temples at Ajanta and Ellora in Maharashtra. Caves 16, 17, and 19 and 26 at Ajanta are excellent examples of pillared halls with usual cells with shrines in the back containing Buddha figures. The mural paintings in the Ajanta caves of the Gupta period are devoted to the illustrations of the Jataka, life stories of the Buddha including commentaries of the contemporary Indian life, the artists exert not only in depicting human and animal figures but also express their decorative genius by adorning the ceilings, pedestal of columns, door and window frames. The famous paintings at Ajanta are in caves I decorating the wails with free flowing composition and crowded groupings, the enormously large figure of the Bodhisattva, created primarily by modulations of colors rather than through lines emerge through dim interior. The shading and elucidation of the three dimensional entity capture the essence of the Buddha. The figure of Bodhisattva Padmapani is a perfect embodiment of compassion and tenderness. The influence of Gupta tradition can be detected in the succeeding period of art during the period of the Palas. The best examples of this tradition is found a Nalanda, Kurkihar in Bihar and Orissa and other places. Looking at the assemblage one may very well understand how the earlier Pala artists depended on the stylistic forces of art on the Buddhist sculptural styles from Sarnath. The slender, elongated Buddha-Bodhisattva figures of nalanda and also of Orissa are clear reminiscent of late Gupta period carvings. The minute execution of the bronzes especially of the smaller ones from Nalanda has excited the admiration of all art lovers of the world. Several Nalanda bronzes, have been recovered from Nepal, Tibet and Java. 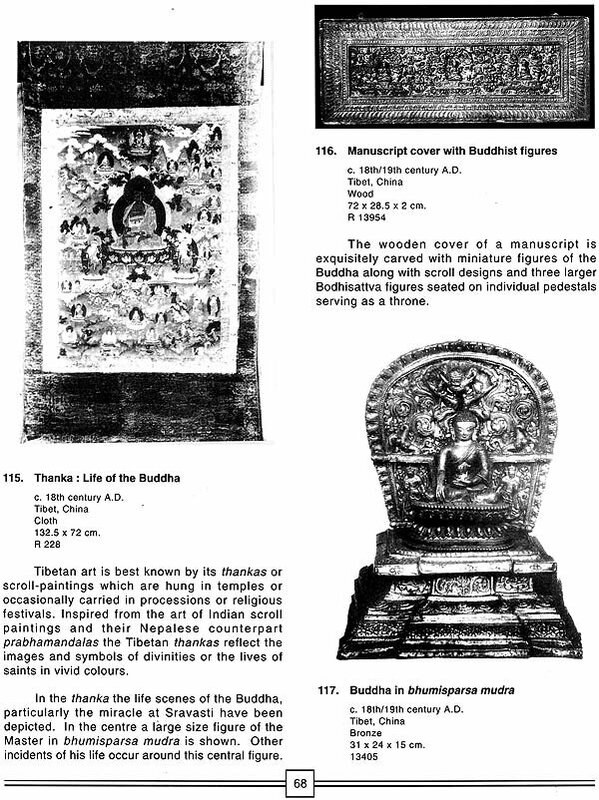 Equally interesting are the palm-leaf illustrations of the Buddhist manuscripts of the Pala period. The miniature paintings executed within the narrow dimension of manuscript page show the skill of the painters. The Pala style of painting, as pala sculptures and bronzes, had influenced the art of Nepal, Tibet and the Further East. Under the patronage of the palas, a number of important centres of mediaeval Buddhism sprang up in Bihar and Bengal. Bodh Gaya and Nalanda in Magadha (Bihar) Paharpur in North Bengal drew pilgrims from different parts of the Buddhist world. In south India Buddhism had a long tradition Despite the importance of Brahmanism during the mediaeval period there was an important center on east coast. Historically we come to know that during the mediaeval period a colony of the Malaya Buddhists was established at number a places on the east coast under the patronage of cholas. In the 11th Century A.D. they erected two temples with the aid granted by Sailendra kings of Java and Sumatra. Nagapattinam was a place of pilgrimage for the Buddhists of different places of India as well as outside. The bronzes of this site are some of the finest metal works of South India.